Camas and Washougal may not be big cities, but their elected leaders are never at a loss for supplying controversy. As in the video excerpt from the 1939 Jimmy Stewart movie, “Mr. Smith Goes to Washington,” Washougal city council member Michael Delavar seems to be standing alone right now as he alleges ethics violations against the hiring of Camas’ soon to be ex-mayor, Paul Dennis to head the proposed Camas-Washougal Economic Development Association. Several of you have contacted me inquiring about young Anthony Bittner and what is going on with his campaign. Other than reading in the Columbian that he is conducting a “stealth campaign,” I honestly do not know. Some have felt he might have dropped out since no photo or candidate statement appeared in the voters pamphlet, but I can report that is not so. Hey supporters! I actually DID send in a voter’s statement and photo. Still trying to get to the bottom of why it was not in the pamphlet. Here is the statement I submitted. Please forward to all your friends and supporters. I appreciate you all.\! My name is Anthony Bittner, running as a new generation of Republican. I am not a politician, not bought by special interests, but rather a statesman and citizen who will listen to you, not talk at you. I am running to balance our State’s budget by offering fiscal solutions, not more complaints. My Agency Reduction Act, and business tax break proposals, will lower State spending of your money and get Washington on the road to recovery. I have no idea why, if he sent it in, it was not included, unless they received after the deadline. But, it’s nice to hear he is still campaigning. We’ll see how it all shakes out come August 18th. Remember, vote and get your ballots in before August 17. Tags: 18th Legislative District, Anthony Bittner, Jon Russell, Voters Pamphlet. Way to go, congratulations, Ann. Rivers was honored by the Friends of the NRA in February for her work on behalf of the Clark County Competitive Shooters. She and her husband Fred have been an NRA members for many years. “It is such an honor. First to be honored by the Friends of the NRA in February, and now to be endorsed by them, I am truly grateful,” states Ann. Growing up in a family of hunters, Ann has hunted many times with her husband and two children. “One of the many legacies I want to leave behind is the right to hunt and to insure that families coming on after mine will continue to enjoy this fantastic hobby and adventure,” Ann said. Ann is running for the open seat vacated by State Representative Jaime Herrera. 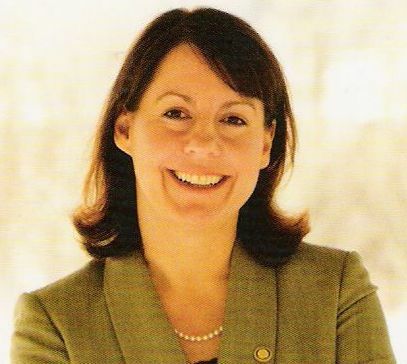 The NRA indicated that Ann Rivers’ primary opponents were not endorsed because these candidates indicated hostility towards the second Amendment. To learn more about Ann Rivers and her campaign, please visit www.electannrivers.com. Ann Rivers continues to outpace her opponents and this latest endorsement, added to the Longview Daily News and the Columbian along with several others, shows the quality of who she is. Ignore the smears being leveled her way and reject the despicable cur who initiated them. Ann Rivers is truly One Working for All. The Longview Daily News has today, Sunday August 1 issued Ann Rivers an endorsement to advance as one of the candidates in our top two primaries to win the seat being vacated by Jaime Herrera for the 18th legislative District. They also included Washougal’s scandal ridden council member, Jon Russell. Rivers was considered the favored to win the seat Herrera was appointed to in late 2007, until Herrera suddenly appeared and became the hands down favorite, somehow. What they neglected to include was Russell’s dismal performance while on the council where $100,000 came up missing and he pointed all blame on the Republican mayor, Stacee Sellers that he threw under the bus in order for Democrat, Sean Guard to be elected. Russell, seriously lagging in both funds and supporters, is resorting to the sleazy tactics he is known for by trying to link his opponent to a blogger who has exposed Russell’s own corruption and shortcomings continually on the blog site Jon Russell Watch due to a past business arrangement. He condemns Ann Rivers, even trying to begin a rumor that she is not pro-life knowing her actions in regards to pro-life is something impossible for him to match, by “guilt by association” and gives himself a pass for throwing a Republican under the bus in favor of a Democrat in 2008. Jon Russell Watch is also where Jon was exposed for claiming an Academic degree he does not hold, as picked up by the Columbian. Ann Rivers, besides being the best qualified candidate, has remained above the fray. Although she knows this blogger, so does Jon Russell, they also having worked together in the past. Ann Rivers is the candidate that called on ALL candidates to respect and restore each others campaign signs as they became vandalized, a call Russell seems to have ignored as far as I can tell. Rivers and her husband have maintained that pledge since making it, restoring and repairing competitors’ signs. While I concur with the Daily News on Ann Rivers, if I lived in the 18th legislative district, I’d give serious consideration to Brandon Vick for one of the top two spots. I haven’t mentioned much about Brandon Vick, also vying for the 18th Legislative District seat that Jaime Herrera is stepping down in this campaign season. He hasn’t been rated with the top runners, but he has run a clean consistent campaign, unlike some others. I first met Brandon during the 2008 campaign season at a Clark County Republican PCO event for new PCO’s to get to know each other and to hear what was expected of us. Brandon showed his interest in local elections and growing the GOP. He expressed his ideas and listened to mine. I was a bit surprised to see that he decided to campaign for the seat Jaime Herrera will be vacating as the field already had well-known candidates announcing they were going to try for the seat and Brandon is a novice. But, file he did and he campaigns as hard as any candidate out there. Even though he and I might disagree on some points, I have to say I admire not only his tenacity in running, but for running a clean campaign, separating him self from some of the viciousness we have seen from Jon Russell. Russell, even though already elected to a city council position, could take a few lessons from Vick. Funds have not been flowing to Vick in large numbers but that has not dampened his spirits. 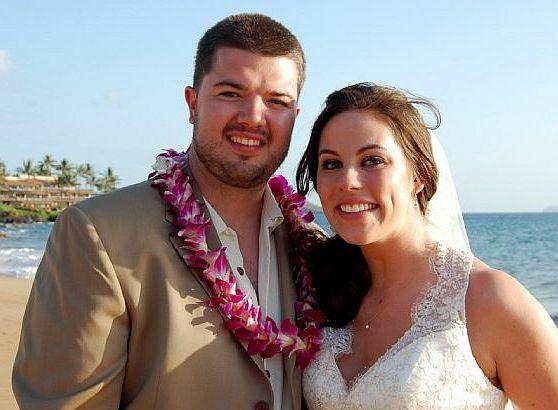 Brandon, with his lovely wife Darci by his side, can be seen manning booths for Vick, door belling, marching in parades and giving speeches at events. Obviously, he is not a quitter, even with the odds stacked against him. Brandon works in his families business, Vick Landscaping established by his grandfather in 1961. I presume he oversees much of the operation today, but Brandon also impresses me as a “hand’s on” sort of guy who isn’t afraid to get his hands dirty. Although scant on political experience, he brings with him some admirable traits, having earned Eagle Scout in the Boy Scouts, the highest honor you can attain in the organization that is responsible for turning many boys into men with a sense of pride in America and some impressive volunteer work for someone as young as he is. I might not agree with every point Vick speaks, but he stands before an audience and articulates his vision clearly without parroting talking points picked up elsewhere. Like any other novice candidate, there is a touch of naiveté as to just how government actually works, but Brandon has a vision of one day changing that, making government more responsible and less intrusive. I have to credit Brandon in that for as little money as he has raised, he has used it wisely in running a smart campaign that, as I said above, has been very clean, avoiding uncalled for pot shots at opponents or belittling them either. He has opted to rise above the dirt and just speak his message. Odds are that he will most likely not make it past the primary, but I wouldn’t count on the odds. Jon Russell is hurting himself by running a sleaze campaign against presumptive front-runner, Ann Rivers while Brandon Vick continues to voice his message and gain recognition. With Russell wallowing in the mud and Democrats not favored this election season, there is every chance Brandon Vick will win one of the top two slots in our top two primary. Should he not gain one of the slots, I hope to see Brandon running for another office in the future. We need young people like him in office and even though I can find areas to disagree with him on, his vision will be needed in the future. Win or lose August 17, Brandon will have set an example of how to run a clean campaign others would do well to follow. Print media has began issuing who they endorse for office and some desperate candidates hoping to advance are reverting to sleaze politics against an opponent they cannot match in experience or ability. Nowhere can this be seen any better than in the race for the 18th Legislative District seat Jaime Herrera will be leaving. Since announcing her run for the seat being vacated by Brian Baird, several have signed on to replace outgoing Herrera. Some tried to win the appointment to the seat in 2007 and were turned down, Herrera being chosen. Early on, Ann Rivers, one who was once considered the favored for the seat Herrera was first appointed to, jumped to a commanding lead in donations and supporters. Another, who was knocked out of the run to replace Baird by Herrera’s entrance, is Washougal city council member, Jon Russell, who has been floundering since he entered the race. Jon, not well known for running clean campaigns, has been able to only raise about a fourth of the funds Ann Rivers has and has failed to gain the support she enjoys. So, out comes the sleaze we have seen before from him and his surrogates. Rather than refute individual claims made against Ann, let’s look at just a couple reasons that show why Ann Rivers has maintained such an insurmountable led over Russell and would represent taxpayers in the 18th much better than an ambitious person such as Russell could. 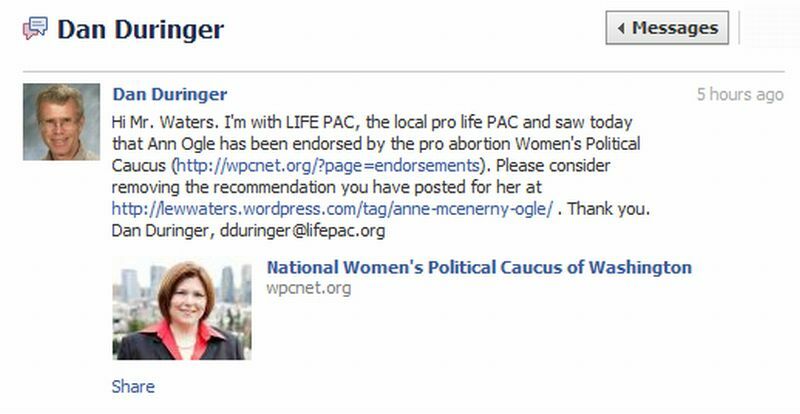 In spite of knowing that Ann Rivers is pro-life, Jon tried a little seed planting at a Clark County Republican Women’s candidate’s forum recently, strongly hinting that she might not be pro-life. He did this knowing full well that Ann has shown her pro-life stance at an early age that is physically impossible for Jon to match. Knowing this, Jon chose to hint that Ann is not pro-life! Jon, through a surrogate, questions Ann’s party loyalty, completely ignoring how he threw a fellow Republican under the bus in favor of a Democrat one week prior to an election, giving the win to the Democrat. Jon has decided a former non-political business association with a Democrat raises questions about her ability to serve in the legislature. Of course, Jon neglects to mention that through his company, Northern Concepts, he advocated for the largest tax increase ever to face Clark County for the Port of Vancouver. Fortunately, the measure failed. Such is the sleaze seen in a Jon Russell campaign. He cannot match her in ability, class or ideas, so he resorts to this sort of sleazy tactic. A few weeks ago, I met Jon for coffee and in our talk, I warned him about this type of campaigning. Apparently he chose not to listen. How pathetic for a young candidate to claim, “I am a Christian because my life was forever changed by the gospel of Jesus Christ,” then resort to such sleazy tactics as this, stepping on people who are in the way of his overly ambitious effort to climb the political ladder. There is a reason Ann Rivers has raised funds at a rate of nearly 5 to 1 compared to Jon’s and enjoys wide support. Ann Rivers offers what voters are looking for. I applaud Republicans Brandon Vick and Anthony Bittner for not resorting to the sleaze we see coming out of Jon Russell’s camp and for running clean campaigns like Ann is. As I said once before, Jon Russell is his own worst political enemy. Jon Russell, Washougal’s erstwhile 3rd Congressional District candidate and embattled council member is at it again. 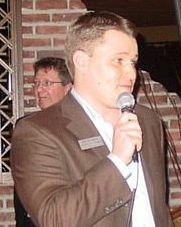 After dropping his poorly led campaign for the 3rd Congressional District, shot to pieces once perky little Jaime Herrera suddenly jumped in less than 2 hours after Brian Baird announced retirement, Russell has decided to commit further political suicide by engaging in a personal online feud with local Blogger, Kelly Hinton by creating a blog that Jon calls Fact Checking The Web. This seems to follow a recent pattern by a Clark GOP Party Board Member who supports Jaime Herrera to falsely link 3rd Congressional District candidate, David Castillo to words Kelly wrote as “reason enough to support Jaime Herrera.” The Board Member has since admitted to a “knee jerk reaction,” indicating they now see their call was wrong. Kelly has an acerbic style to his writing that irritates a lot of people. But he also admits when he is wrong and posts corrections with apologies. He is also rarely wrong factually. Kelly, like me, writes what he feels and takes no direction from anyone. Likewise, even though he has a political consulting company, he does not currently work for either the Castillo or the Rivers campaign, confirmed to me by the parties accused. Kelly also has a First Amendment right to freedom of expression and no, he and I do not see eye to eye on every issue. Russell, a highly ambitious young man struggling to climb the political ladder to higher office, has been under fire for displaying poor judgment last year as a scandal broke in Washougal concerning unaccounted for funds to the tune of $100,000.00. Jon immediately distanced himself from the issue by pointing all fingers at the mayor, Stacee Sellers, one week prior to the election. Sellers, a Republican like Russell, lost the election to the Democrat challenger, Sean Guard, who originally sent the matter of the unaccounted for funds to the State Auditor. Sean is also the brother of Jeff Guard, the mayor that was defeated by Stacee Sellers in the previous election. Jon continues to try to distance himself while Kelly keeps hammering on the scandal that would otherwise most likely be swept under the rug by now. Jon states his claims on his “Fact Check” blog, but offers no documentation in his defense, just raises false allegations against his opponent. Jon has yet to admit to his lack of foresight and instead, decides to engage in a personal feud with a blogger and desperately try to tie his opponent to something she has absolutely no control over. Jon is committing political suicide with this tactic as he now focuses on a personal feud and not his message that he wishes voters to hear. I recently sat down with Jon for coffee and told him that he needs to change his campaign style, if he wishes to succeed. The era of stepping on others to get ahead is over. 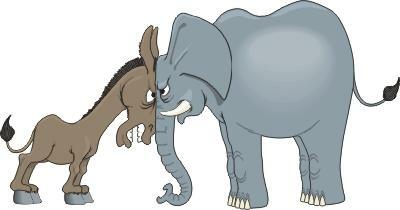 The era of throwing fellow Republicans under the bus doesn’t resonate well with voters. Drawing voters’ attention to blog sites you would rather they not read by engaging in a personal feud will only allow those voters to see documented claims against you. Many people, especially candidates, marginalize blogs or do not read them at all, opting instead to stay focused on their message. Russell chooses to stop speaking his message to voters and instead feud with a voter who blogs. In the process, he paints himself as petty by falsely linking his opponent to that blog, just as he did when he tried to begin a rumor that she is not pro-life, in spite of admitting to me that he knows of her history proving otherwise. If he is willing to ignore his campaign for a personal feud, how ineffective would he be if he somehow gained a seat in our legislature every time someone in the media or voters disagreed with him? Sorry Jon, but you are your own worst political enemy. You only hurt yourself with these juvenile outbursts and false linkage of Ann Rivers to Kelly’s blog. Jon Russell, Washougal Republican City Council Member, Mayor Pro Tem, former candidate for Washington’s 3rd Congressional District and now candidate for Washington States 18th Legislative District seat being vacated by Jaime Herrera has been accused in both the Columbian and on Clark County Politics blog of laying claim to a degree he does not hold. Both the Columbian and Thomas Edison verify it: Russell’s claim of a college degree is fake. I know both Hinton and Rivers and yes, they are business partners and friends, but I also know that his blog was exposing Russell long before Ann Rivers began campaigning for the seat Jaime Herrera is vacating. I can assure you Ann Rivers has no connection to this revelation on Russell’s degree he claimed. Russell claims he “has earned more than the 60 credit hours required for an AA degree,” which is meaningless if he did not fulfill the requirements necessary to actually obtain the degree. This type of resume’ embellishment has made news elsewhere in recent months as we saw Connecticut’s Democratic Attorney General, Richard Blumenthal, who gradually insinuated he served in Viet Nam when he never did. Or Republican Mark Kirk, who overly boasted of a minimal unit citation as if he were personally awarded a citation of high merit. And now, we apparently see Jon Russell building a resume he is not yet entitled to. Jon is not the first politician to try this tired tactic of embellishment and I can assure you he will not be the last. But, be it Military Service or Academic claims, they will continue to be exposed, maybe even sooner than some think. June 17 saw the Clark County Republican Women hosting another “get to know your candidates forum” luncheon at Club Green Meadows, this time to give voters a chance to question and get to hear candidates for the legislative candidates vying for election this year. Attending the event to answer potential constituent questions were, Paul Harris (17th legislative district position 2), Brian Peck (17th legislative district position 1), Ann Rivers, Jon Russell and Brandon Vick, all 3 vying for the nomination to replace Jaime Herrera in the 18th legislative district, Craig Riley (49th legislative district position 2), Bill Cismar (49th legislative district position 1) and Brice Chandler, incumbent 15th legislative district representative. Candidates attending the luncheon, but not participating in the question session were John Jenkins (Vancouver city council position), Alan Svehaug (Clark County Commission), Peter Van Nortwick (Clark County Assessor) and Daniel Weaver (Clark County Assessor). After enjoying a delicious ham lunch, candidates sat down and began taking random lessons from those who came to hear where they stood on relevant issues. Questions were submitted by paper and placed in a basket, then randomly chosen to be asked. Due to time constraints, not all questions were asked, but enough to give voters a better view of who the Republicans have running for office. With a mixture of humor and seriousness, candidates each answered the random questions in short statements. Brian Peck stated he supports a balanced budget, privatizing the liquor control board, the Puget Sound Ferry system and would like to see e-verify, the free system to conform citizenship, implemented for receipt of entitlements. Bruce Chandler added that he would like to see e-verify mandated for public employees statewide as well. Ann Rivers said she would like to see the state budget written by the state auditor write the budget and legislators explaining each piece of extra spending they try to attach to the budget. Adding some humor to the afternoon, in reply to whether or not they would support e-verify to determine citizenship on hiring, Bill Cismar answered “si,” drawing an expected laugh from all in attendance. Recalling how his incumbent opponent, Jim Jacks boasted of being governor Gregoire’s “mouthpiece” in Clark County in the 2008 election, Bill Cismar stated, “Gregoire doesn’t need a mouthpiece, she needs an ear piece,” indicating the governor needs to listen to taxpayers, not dictate to us. Also in regards to Jack’s often stated “listen and learn” stand in 2008, Cismar said he would listen to main street and take that to Olympia to tell them instead of just listening to senior party officials. Cismar says Jacks “listened and learned” from Olympia, not from small businesses. With the recent slate of tax increases and yet another burgeoning budget shortfall and seeing that Jim Jacks voted lock-step with the majority in passing those bankrupting taxes, I agree. Craig Riley expressed his desire to increase jobs and lower taxes to a more reasonable level, alleviating the burden on small businesses and the average taxpayer. Jon Russell said he advocates cutting off public unions from contributing so heavily to campaigns, especially those that serve their interests. In another questioned posed, whether or not the candidate would support another should they not receive the nomination, Harris and Peck both reminded all they had no opponent from the GOP in a humorous manner. All said yes, but Jon Russell left the audience a bit confused when he replied, “I will if they’re pro-life.” Jon knows that every single person sitting at the table with him is pro-life, so it remains unknown who that was directed at. Be it a cheap shot or seed planting to suggest another in his race isn’t pro-life is unknown. Jon should explain that strange comment. In all, though it was very informative luncheon and I have no regrets in going. A young lady sat at my table that had never been to one of these forums and also said she learned a lot. Thanks must be expressed for the efforts of the Clark County Republican Women in hosting these forums and making candidates openly available to voters. I hope you make the effort to attend the next one. Not only will you enjoy a great meal, you will come away with a better idea of what candidates running for office intend to do. Jon Russell, Washougal City Council Member, former candidate for Washington’s 3rd Congressional District, who bailed after seeing any hopes me held dashed by the entrance of Jaime Herrera, and current hopeful to replace Jaime as she steps down from her seat in the 18th Legislative District, is still trying to build a resume’ exaggerating questionable accomplishments. After he tucked tail and slinked away from the 3rd CD run, obviously sucking up to Herrera by endorsing her after she destroyed any prayer he had, I placed Jon on ignore. But, sometimes, I just can’t ignore obvious bogus and exaggerated claims. Although Stacee Sellers did step down before her time was fully up, I have yet to hear of any charges of corruption filed against her or of any criminal charges filed on anybody over the mis-actions that she and the city council allowed to occur. Jon also doesn’t say that he was on the oversight committee, signing off on the very expenditures he says were corruption. Although Stacee Sellers did step down before her time was fully up, I have yet to hear of any charges of corruption filed against her or of any criminal charges filed on anybody over the mis-actions of her and the city council. To me, it only stands to reason that since Jon had oversight on the mayor’s expenditures and signed off on those expenditures, can he be any less corrupt than he accuses her of being? Jon, clean up the mess you helped create in Washougal before you try to get to Olympia to create new ones. Anthony Bittner has come forward and condemned the destruction of campaign signs that seems to have escalated with the presence of the Washington State GOP Convention in town this week and weekend. Several signs have been vandalized and whoever has done it has placed Bittner’s in front of, next to or inside of vandalized signs, being just too obvious in trying to set up Anthony as if he were doing the destruction. Seeing how so many signs have been destroyed this weekend I contacted Anthony to see if he knew anything about it and to recommend that if some of is supporters were engaging in this conduct, to have them knock it off as it would only reflect negatively on him and his campaign. As we all know, campaign signs are expensive and can eat up a large chunk of a candidates funds, constantly replacing them. Ann Rivers, Anthony’s opponent in the race for the 18th Legislative District, issued a call earlier for candidates to repair everyone’s signs they see knocked down or vandalized and pledged to do so herself. Anthony has answered the call as he assured me that he has repaired some of her signs over the last few weeks. Ann Rivers has posted some photos on her facebook page showing the destruction this weekend. Whoever is doing this is unknown, but it is a juvenile prank, whether it’s younger kids or not. I know both Ann and Anthony and this is not the conduct either appreciate or would engage in. If it is a supporter of any candidate, you only hurt your candidate by engaging in such juvenile conduct as well as drive up the cost of their campaigns that could be better spent elsewhere. It seems every campaign, sign destruction grows around town. Whether it is kids seeking kicks or opponents from the other party, it is unnecessary, uncalled for and counter-productive. For all of the calls to end sleazy politics and run clean campaigns from voters, you’d think some would realize that engaging in such juvenile antics as tearing down signs of candidates is just that, as sleazy as it gets. If you witness someone tearing up signs, take their photo if possible or write down the license number of their car then turn it over to Police. Destruction of campaign signs is a criminal offense and maybe some fat fines might help such vandals mature some. Let’s grow up, Clark County and show the rest of the state how it should be done. Last evening, May 26 saw the Southwest Washington Campaign for Liberty hosting a ‘question and answer’ forum of candidates vying to replace outgoing legislator, Jaime Herrera in her 18th Legislative District seat at Battle Ground High School. A series of questions were asked of all candidates by C4L then a series of spontaneous questions from the audience were asked of the 3 Republicans, 1 Democrat and 1 Independent candidates. Knowing that one candidate has received the endorsement of some of the organizers of this Campaign for Liberty group, I was pleasantly surprised to see the questions were hard hitting, if not somewhat complicated at times and none were given any softball questions that might give a candidate any advantage. Also surprising was hearing how often the candidates seemed to agree for the most part in their answers. The Columbian’s Kathie Durbin calls it, Candidates find common ground at forum, 18th District hopefuls share disdain for power of federal government. Each candidate gave a short introductory statement outlining why they are in the race. Dennis Kampe, the lone Democrat running described his life of working and living in the 18th and dealings with the union, specifically the Machinists and Aerospace Workers Union that I once belonged to. Brandon Vick followed with a quote from the state constitution as his reason, citing all power is from the people and how Olympia has moved away from that. Jon Russell described himself as a “city councilman (Washougal), Christian, conservative, constitutionalist & Republican,” adding that we must control the behavior of our politicians. Ann Rivers, the current leader in funds raised by a significant margin, stated she is running because the state government is off track and asking for all of us to be part of the solution to put it back on track. Richard Carson, the Independent, described himself as a “fiscal & constitutional conservative” refusing to accept any special interest money or endorsements. Asked if they would introduce legislation to counter possible legislation contrary to the United States Constitution, all answered yes in one form or another, Jon Russell reminding that he voted against accepting any stimulus funds as a city council member, Ann Rivers citing she fought against unfunded mandates in her work and Brandon Vick saying how he supports Attorney General Rob McKenna’s suit against Obamacare. Asked about cities contracting with private companies for red light cameras, Vick admitted that is one subject he hasn’t given a lot of thought to, but joined in with others in saying he opposes such a move, all saying that it would be a matter better left up to local municipalities instead of the state. Asked about a voter approved income tax, answers fell on opposition to such a tax, but if voters approved it, it should be allowed. The subject of the inheritance drew universal opposition from the candidates. Kathie Durbin gives a good account of other answers to questions at the link above and is well worth a read. I was struck too by closing comments from the candidates. All outlined why they feel they would be the best one to represent the district, relying on their values and belief in the constitution. Jon Russell falls back on his record on the city council, saying not to heed “distortions” by some. However, he glosses over last years scandal involving mayor Sellers and his part in that which is part of the public record as well as many news articles outlining his own efforts with it. Jon, if you plan on running on your record, you have to include all of it, not just the parts you feel make you look good. Each candidate made a good case for themselves and admittedly I was surprised at how much they agreed in answering. Dennis Kampe often sounded as conservative as the rest. Ann Rivers, in my personal estimation, seemed to have the best grasp of the issues. Brandon Vick apparently has been doing his homework too as he performed better last evening than I have seen before. Richard Carson showed his views well. In all, the forum was very informative and I believe the 50 or 60 people I estimate attended came away with a better understanding of each candidate. I congratulate Katja Delavar and others involved in organizing the event and hosting it. Will Jon Russell and Others Join Ann Rivers to End Campaign Sign vandalism? I have to admit, this press release put out by the Ann Rivers campaign is one of the classiest moves I’ve ever seen a candidate do. RIVERS CAMPAIGN ANNOUNCES PROGRAM TO END CAMPAIGN SIGN VANDALISM; CHALLENGES ALL CAMPAIGNS TO JOIN. Ann Rivers announced today that her sign crews have been directed to repair all campaign signs of either party out in the campaign area. “It sickens me to see vandalized signs of any campaign. As a candidate, I know how hard everyone has worked to get the funds necessary to pay for these signs, and how much work campaign volunteers go through to get the signs up,” she said. Each campaign has spent a lot of money getting their signs up for name recognition. The largest signs can cost as much as $80 each. “Vandalism and sign theft will cost all campaigns in Southwest Washington thousands of dollars and hundreds of hours of volunteer time that can be put to much better use,” Ann said. Ann, who is running for the House seat in position one of the 18th District, is calling on all campaigns in both parties to follow her lead. “Sign destruction has been a bipartisan effort. There appears to have been a concerted effort to knock down all campaign signs regardless of party in the same locations, and that has to stop,” she went on. “I call on all campaigns and both parties to follow the example of our campaign and ask their sign crews to repair signs whenever possible, report signs damaged beyond repair to their respective party headquarters or campaigns, and to lend a hand to help end this nonsense,” said Ann. For more information, contact the Rivers Campaign at (360)771-8133, or go to the Rivers Campaign website located at http://electannrivers.com. I live alongside a fairly busy street and over the years have had more than my fair share of campaign signs stolen, defaced and vandalized. They not only cost campaigns money, but supporters most usually make a contribution to the candidates campaign to receive one. I hope that all of the other candidates running in the 18th Legislative District race, Jon Russell, Brandon Vick, Anthony Bittner, Independent Richard Carson and Democrat Dennis Kampe will follow suit. With so many saying they wish to see politics cleaned up, now is your chance to follow suit and begin. Candidate in the 18th Legislative District Race and educator, Bob Dean issued a Press Release today announcing he is withdrawing from the race and endorsed fellow Republican Ann Rivers..
Dean also knew when he entered the race that he would be coaching his high school softball team from Mar 1st until the middle of May which combined with his full time job as a teacher would force him to put the campaign on the back burner. “Teaching full time, preparing kids to take the HSPE and the AP Calculus exam while coaching and playing games every day after school simply kept me from developing the strong foundation I needed to run an effective campaign” Dean said. Dean, a former home builder, is an acknowledged social and fiscal conservative who believes in less taxation and smaller government, but he centered his campaign around education issues and his opposition to Race to the Top. “Government’s massive intrusion into the local control of education at both the state and federal level, has not resulted in improved results. The state of Washington is graduating a lower percentage of students from high school today than we did in 1970 despite a huge increase in expenditures. Race to the top is just another expensive government intervention that promises positive results but has no track record to stand on. It also has the potential to cost this state much more money than we stand to gain from it”, Dean said. In withdrawing from the race, Dean has decided to endorse Ann Rivers for the 18th district seat. “ I have the greatest respect for all of the republican candidates in this race but Ann Rivers offers the most life experience and experience in Olympia. As a former teacher, she has the educational background and knowledge to champion the issues that I am highly concerned about. Her character, work ethic, and commitment to conservative values will serve the district well.” Dean stated. It was my pleasure meeting and corresponding with Bob during his campaign and I am sure he will continue supporting conservative values and ideals in educating our children. I don’t know what is happening in Shannon’s family, but in my book, any man that places his family first has my respect. Remaining in the race are Ann Rivers, clearly the leader in funds raised, Brandon Vick, Anthony Bittner and Washougal city council member, Jon Russell, who himself recently withdrew from the race for the 3rd Congressional District citing Jaime Herrera’s entrance into the race as drying up his donations and support. Cowlitz County Endorses Herrera and Barnett? I was quite surprised to receive an announcement this evening that the Cowlitz County GOP issued their endorsement to Shannon Barnett, candidate for the 18th Legislative District (position 1) seat now occupied by Jaime Herrera, who is vacating the seat in her quest to run for the 3rd Congressional District seat being vacated by Democrat, Brian Baird. Equally surprising and for the same reasons is they have issued an endorsement of state Representative, Jaime Herrera. What surprised me about this endorsement is that there are 5 other Republicans vying for the seat as well, one having raised three times the campaign funds Shannon has and we are still 5 months away from our Primary election in August. In Herrera’s race there are 3 other Republicans still running. We haven’t even passed the June filing deadline for candidates and a county party has endorsed a candidate? While I disagree with party chairs making early endorsements, I understand they are individuals and there is no requirement that they not in party by-laws. As stated, though, that is an individual endorsement, not a county party. I have nothing against Barnett and have not spoken to him. I haven’t covered him a lot due to his not ever contacting me, save a single campaign flyer a few weeks ago in my mail, which struck me kind of odd, being as though I live in the 49th Legislative District, not the 18th he is running in. Last I heard, it is up to candidates and their campaigns to contact people for support or coverage, not the other way around. In the case of Jaime Herrera, I have several serious questions on her judgement that remain unanswered. That has nothing to do with this endorsement or my puzzlement over it, though. Since the endorsement was made at their county convention this past weekend, I have to assume they have met with all 6 candidates in the 18th District race and all 4 in teh 3rd Congressional District race and given each equal consideration before arriving at their decision to issue an official endorsement this far out. I have no idea since I don’t live in Cowlitz. Surely they would not do so merely because he and Jaime are local people? One reason I have a problem with such an endorsement as this made by the party this early is what about voters within the counties portion of the district? Are they not entitled to hear all 10 candidates and choose for themselves who best to vote for, without undue influence from the party they will undoubtedly be seeking information from? Is there even a need any longer for the other 8 to visit Cowlitz County to campaign, knowing there is no possibility they could receive the party’s endorsement? I am not calling on anyone to resign or be sanctioned, even though I see this as inappropriate. Nor should this be taken as I am against Shannon Barnett. I am not. Like I said, he has made no effort to contact me so we have not spoken. I wish him all the luck there is in his race. 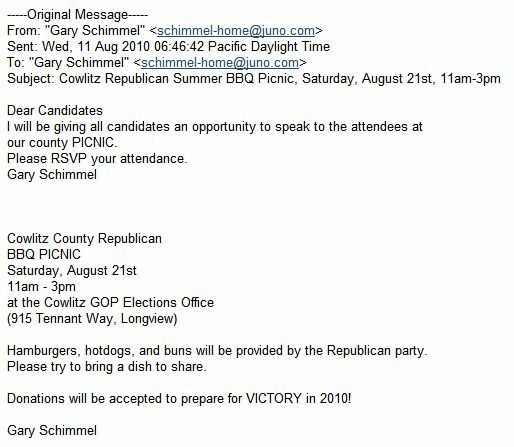 I do feel the Cowlitz County GOP is doing voters within their portion of the 18th district and 3rd Congressional District a huge disservice, though. What they do from here, if anything, is entirely up to them. I simply think Cowlitz County residents deserve better from the party up there.